Sorry, I'm not much for social media, so pretty much any excuse is good enough for me not to post something, but it turns out that Deluge did make it to the water the other day. I'd say she's been pretty impatient with her owner for quite a while now, and pretty much took off like a shot from the boat ramp. Being new to the boat, and new to sailing a ketch, it was a bit of work for us to keep things glued together as it were. 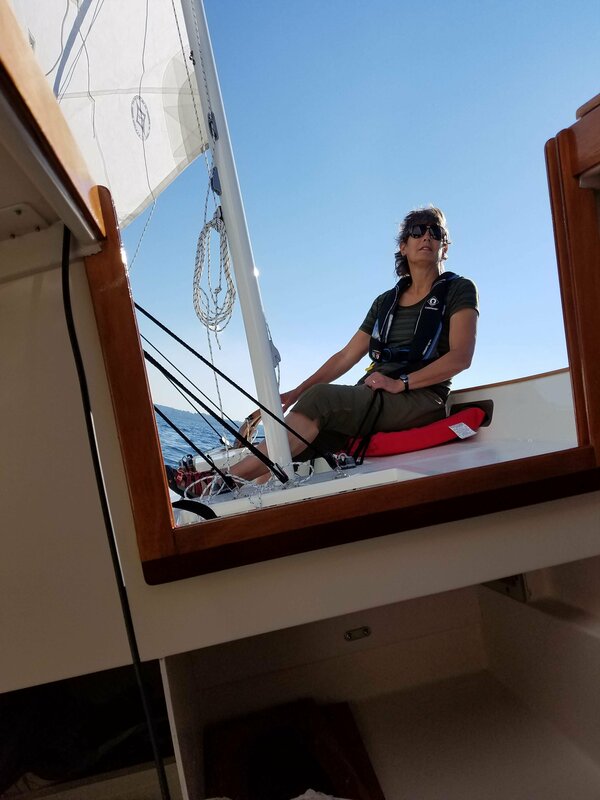 We sailed right out into 15 to 18 knots, just minutes after I'd declared to Peg - 'Ahh, let's just skip those reefing lines - there's no way we'll need those today.' I was expecting 10 or less, but the boat managed it all without so much as a ruffled feather and sailed just beautifully. We had no bucket, so couldn't fill the ballast tank all the way full, but even at that, the ballast helped quite a lot. We had a compete blast - what a great boat! I was surprised how stressful the very first trailer trip was. 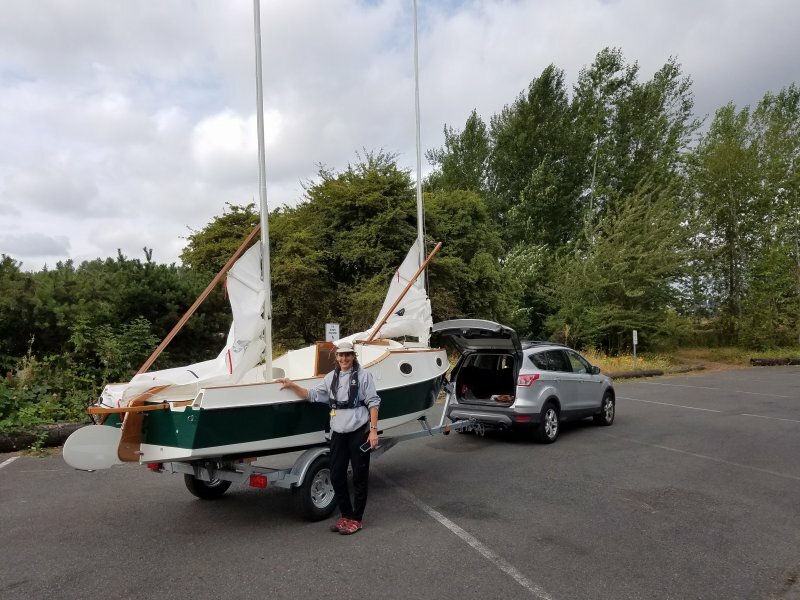 Neither of us have ever trailered anything before, let alone a boat. We had a few mishaps -- best not to go into the details -- but in the end all made it home safe and sound. Here are a few flicks. We went out again the following day with only 5 knots of wind (reefing lines in) - a lot less excitement, but just a gorgeous day on the water. 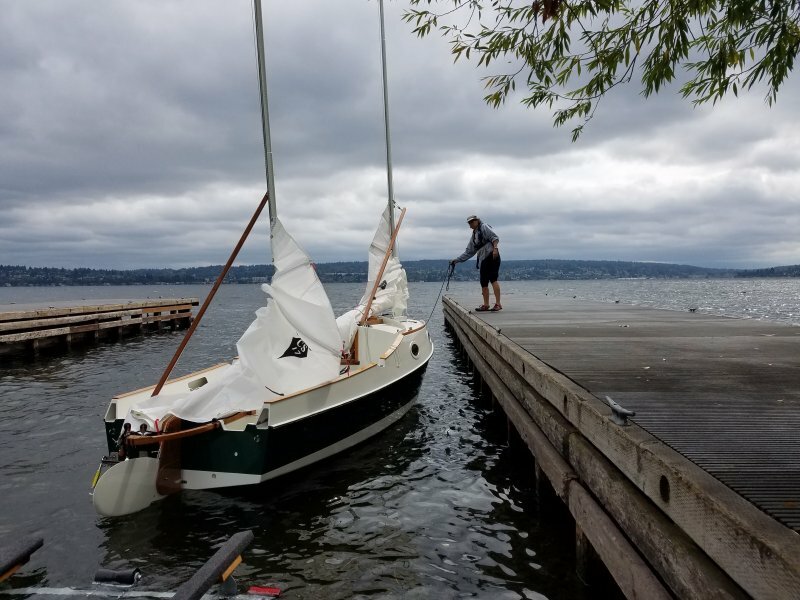 Lake Washington is around 73 degrees at the moment. 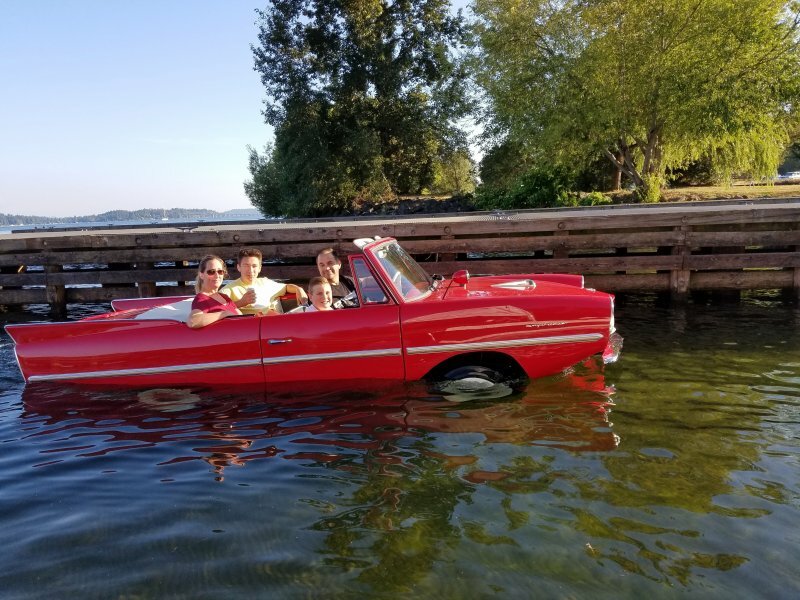 We really had a lot of fun, returning to the ramp around 7 pm feeling all perky figuring we had The Coolest Boat this side of the Cascades, when a family comes sailing up in their red Amphicar. The only one of those I ever saw was in a Popular Mechanics magazine at least 55 years ago. Happens every freaking time I get feeling all perky and puffy. On another note, we're heading to the Port Townsend Wooden Boat festival soon, and I've been hoping, Graham, I'd see you there. I'm doubtful though, since I haven't seen that Carlita's registered. I just learned today that we'll be on display in the courtyard, which is pretty much the center of the festival. Either we won some sort of lottery or I'd say the festival administrators must be pretty interested in your boat Graham - I hope like hell there aren't too many glaring and embarrassing quirks in my build. If anyone else is in the PNW and can make it to the festival, please come find us!! Thanks Graham, Alan, and all the B&B gang for a really great boat. Wow! Great job. I love the color scheme. Please keep posting your adventures. 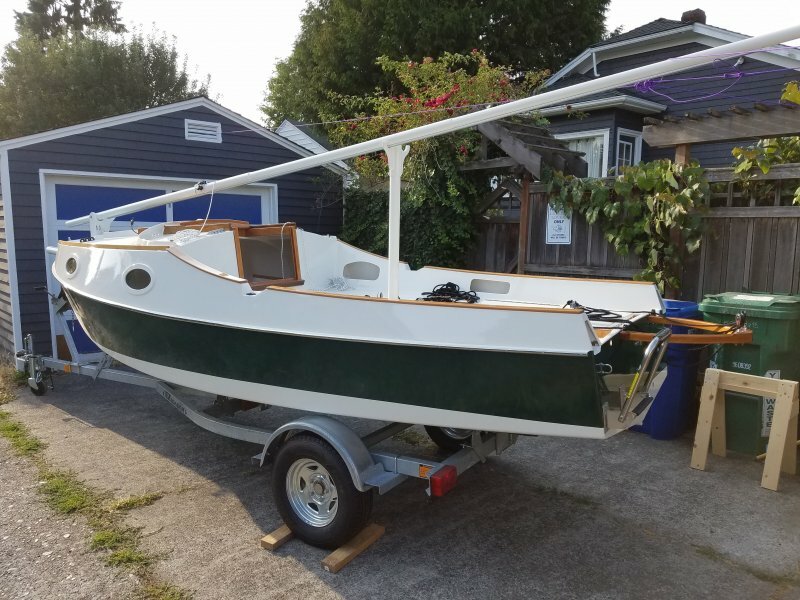 I'm building a 20 and that boat festival and a summer in the PNW is on my list! Fantastic pictures and great reporting. Congrats on the launch. The boat looks wonderful. I really like the laminated boomkin too, nice touch. Your suspicions are correct unfortunately we cannot attend this year. Graham had a great time last year and I wanted to go but it wasn't possible this year. I can send you some promotion stuff. I'll get on that right away. Thanks for the pictures! P.S. sorry we didn't get back to you re the fwd hatch strut kit thingy. I think it got away from us with the shop being so busy. did you come up with something? Holy smokes Frowley, that is one amazing build. I've been feasting my eyes on all of the details. What kind of wood did you use for your toe rails? I will look for your boat at the Port Townsend Wooden Boat Festival. We plan on being there on Saturday. Thanks everyone for the kind words and enthusiasm -- it's cool! Steve, I've been watching your build (and have Really appreciated both your workmanship and the discussions its drawn), so please let us know when you're coming out and perhaps we can do some exploring together. Thanks Alan, I'm thrilled you think it looks ok, but sorry neither you nor Graham can make it out. I chose to put the fridge (not yet built) in the lazarette which required a top hatch cover, which forced me into the laminated boomkin. All the cockpit and deck framing (and sprits) are made from beautiful, old growth, WR cedar salvaged from someone's residential deck. That's also what I laminated the boomkin from. Cool on the promo stuff - it'll be great if we can give people flyers or cards or something, with your web site on them. No, there's no strut on the fore hatch, so if you think of it and can send that along, that would be great. Thanks to you too, Amos - your boat is totally gorgeous, so I really appreciate your comments. I'm embarrassed about the toe rails though. Truth be told, the sheer coaming rails and stbd toe rail is fir. I broke the port toe rail bending it into place and to save time went to home depot to get another piece. HD is a bit casual about labeling their 'hardwoods' and I actually came home with a piece of hemlock. In one (of so many) failures of personal resolve, I figured it'd probably work ok, and there it is. Thanks Terry. That's a long ways to come for you! We'll look forward to your coming by. Looks terrific! Excellent work. You'll be a great B&B rep at Port Townsend. Just a quick update now that we're back from the boat festival to say that there seemed to be quite a lot of interest in the boat and design. We were in the courtyard, and likely most people who went to the festival walked right by the boat. 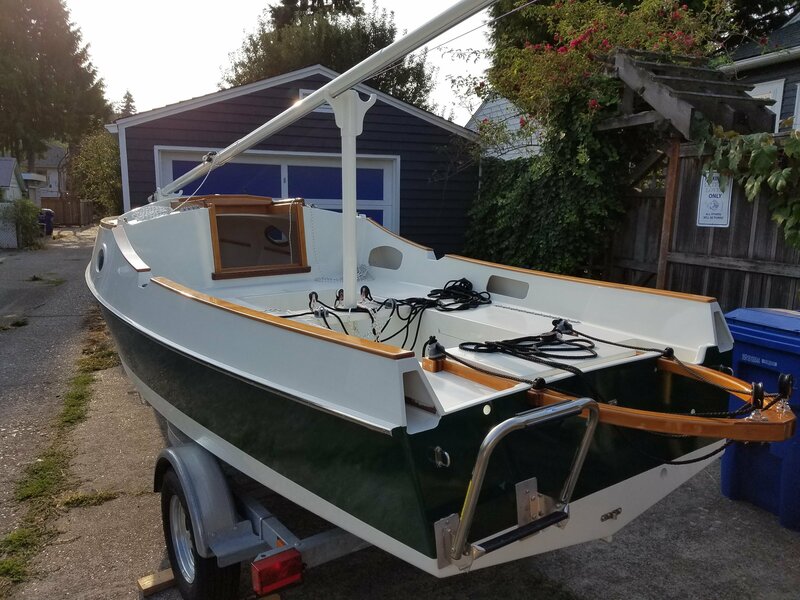 Several folks independently gushed about what a perfect design it was, and we couldn't stand by the boat for long before people wanted to talk about it with us. On another note, when I reviewed my GPS tracks from our first sail, I noticed that the top speed was 17mph. 'That's a laugh,' I thought - 'the GPS must have somehow gotten confused,' and blew it off. As I thought about it this morning, I realized we were in the middle of Lake Washington - a 20 mile long, 2 or more mile wide lake when, several times, we popped up on a plane. How could GPS get confused about that? So now I'm incredulous, but actually starting to believe it's true - 17 mph - nearly 15 knots! Woops - bound to have had to do this I suppose. 17 mph, in fact, is wildly crazy. In fact, after more closely reviewing my GPS, top sailing speed was more like 8 mph - or 7 knots. Sorry about that. I saw 7 knots on a broad reach yesterday (using a Navionics app on my cell phone). I don't think the boat was planing, but I'm not sure. Here goes a dumb question: is it obvious when the boat planes, or is it subtle and something only an expericenced sailor would notice? I don't think 7 is planing, just real fast. When you plane, it should be obvious; you're up on the bow wave and really tracking, feels like a motorboat, little hull resistance. You're going 7 and then all of a sudden you kick into overdrive and you're going 9 (on a standard CS 17, anyway). Usually planing happens on a broad reach, or at least that's the easiest direction to get up on a plane. I say all this not quite sure how a MkIII handles a plane given the water ballast feature. Oh boy. talk about opening a can of worms. Hull speed in knots is 1.34 x the square root of water line length in feet. For a 16'-10" CS17 M1 that works out to 5.5 knots. I believe that means you start climbing the bow wave and begin partial planning above 5.5 knots but don't reach a full plane until some higher speed. My CS17 experience is the boat feels "lighter" at about 7 knots and above 8 were certainly planning and anything faster is just crazy fun. Oops, I should clarify. I was thinking mph, even though Amos said knots, since Great Lakes folks usually use mph for some reason and that's how I have my GPS set up. So, where I said 7 and 9 (mph), that would be 6.1 and 7.8 knots, or approximately what Randy sets out above. Except he does it more accurately. You can still feel for that "overdrive" oomph. Thank you for the explanation Paul and Randy. Yeah - I'm too new to all this to know for sure. We definitely got a pretty clear boost, and the boat just felt like it was on top of the water, and not so much plowing through it. The centerboard (or maybe rudder?) was humming like crazy also - which may mean I have some tuning to do? In any case, we had a pretty fun sail. 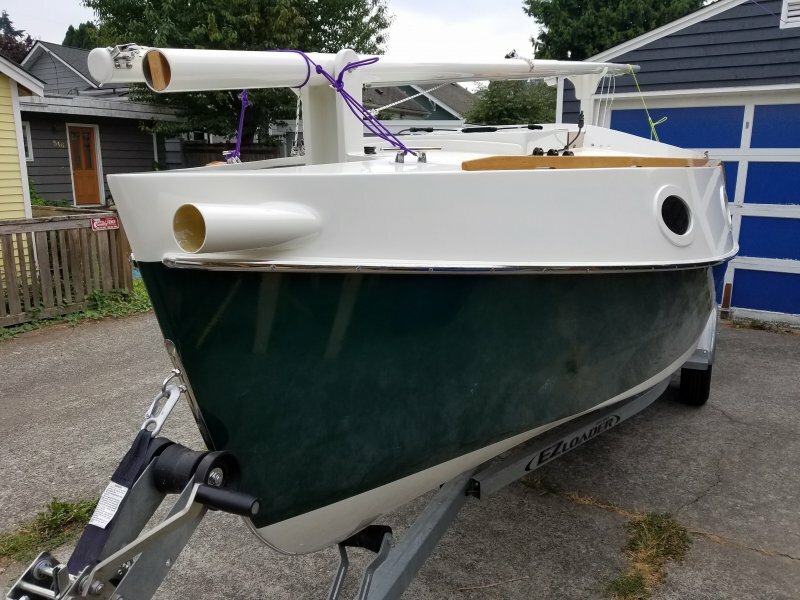 I may be late to the party but no less excited about your launch and especially the boat details and the absolutely drop dead beauty of your boat. 7 or 17 no matter how you measure it. Getting up on a plane in a small boat gets the blood flowing and can give you tunnel vision with excitement. To be precise getting up on a plane in a laser gave me the same feeling as going 175 mph on a motorcycle. While unexperienced in the CS, I suspect the thrill is universal across boats, especially if its one you built. No matter your speed, your boating experiences and pride of ownership will never get old in my opinion.